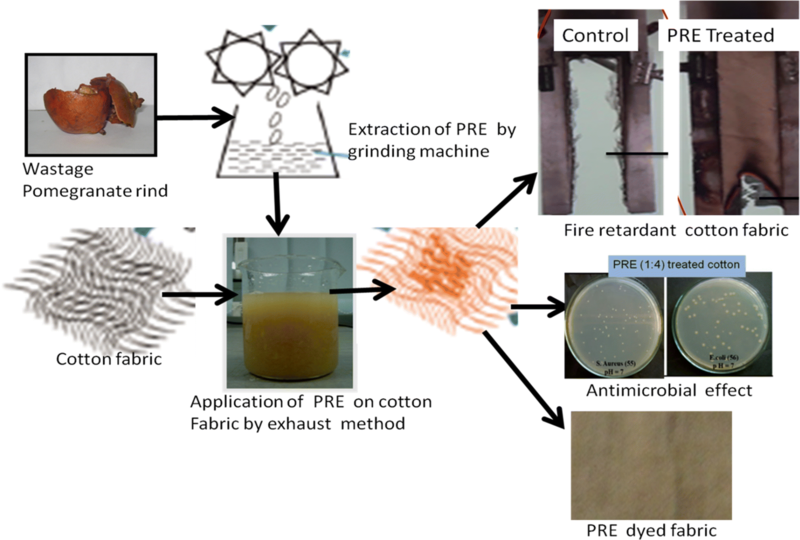 Pomegranate rind (Punica granatum) extracts (PRE), a widely available wastage material, are explored as new multifunctional finishing agent (fire retardant, natural dye, mordanting and antimicrobial agent) on cellulosic textiles. PRE has been applied on the cellulosic cotton fabric at higher temperature (90 °C, 30 min) in different concentrations. 400 g/L PRE extract treated fabric showed 15 times lower burning rate as compared to the control cotton fabric. Thermo-gravimetry of the PRE treated fabric showed earlier dehydration phenomenon and more amount of char mass formation. The resulting fire retardancy of the treated fabric is the combined reaction effect of the acid source (carbamic acid, ammonium salt, hexacontanoic acid, etc. ), carbon source (carbonic dihydrazide, nona hexacontanoic acid, 1 hydroxy 2 pentanone, sugar based material) and blowing agent [nitrogen containing bases like guaninidine, asparigine (amino acid of protein), di amino guanidine and ethanamine, piperidine] present in the PRE extracts as observed from the Gas Chromatography Mass Spectroscopy analysis. Antimicrobial efficacy of the PRE extract on cotton substrate has also been demonstrated successfully against both the Gram-positive and the Gram-negative bacteria because of its tannin and positively metal ion as well as amino acid contents. Furthermore, cotton fabric dyed from the PRE medium with anionic acid dye showed dark colour compared to the acid dyed cotton fabric from water medium, characteristics of the mordanting efficacy of the extract. Extract also has been explored as natural dye for the dyeing of the cotton textile substrates because of the presence of natural colouring material (betacyanin, coumarin, etc.) in it as observed from the phytochemical analysis of the extracts. Authors would like to thank Central Institute of Research on Cotton Technology, Indian Council of Agricultural Research, Mumbai, Govt. 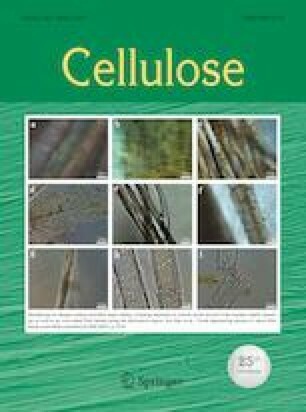 of India for sponsoring doctoral research work of the one of the author (S. Basak) of this paper.